The rich history of Sion mills is best discovered and learned from someone who has lived through it. Our local guides will take you on a journey, originating in Sion Stables, through life in the mill and village and will share a story or two on the way. This tour is supported by our Heritage Trail App, which immerses you in 150 years of linen production, village life, socio economic and political change and shows you how the mill was the centre of the Village. With over 40 listed buildings to view our guides will transport you back in time to an era divorced from modern day living. Our App allows you to see the village, the people, the mill and what life was like at various points in the last 150 years. Deriving its name from the ‘Sidhean’ meaning fairy mound, Sion Mills owes its development to the Herdman Family who established a thriving flax spinning industry there in 1835 on the banks of the river Mourne. The river was the catalyst for the founding of the mill and subsequent growth of the village and establishment of the model community with all the facilities necessary for the welfare of their workers. Today this pleasant tree-lined village is a place rich in architectural heritage, and is officially recognised as so, being designated a conservation area in 1977. 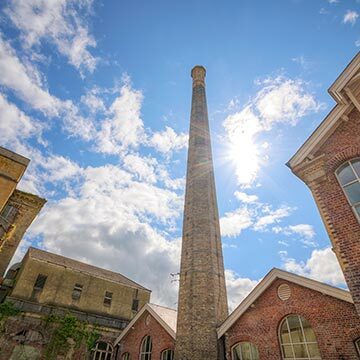 A walk down the Mill Lane to the Mill itself is a walk back in time as the old Mill building looms up in front of you and the restored Mill chimney (restored by the Trust in 2005 – 2006) stand proud against a magnificent scenic backdrop. Although access to the Mill is not possible our guides, supported by the Heritage Trail App, will give you a detailed insight into the workings and history of the site. A walk around the perimeter lets you imagine how the site would have been during its heyday with over 1600 workers producing linen yarn. The Guide will take you to the swinging bridge and impressive Mill weir which was built to harness the power of the river Mourne and produce electricity through the turbines that powered the Mill and the village. Mr John R. Hume, a member of the Heritage Lottery Fund’s team of experts, visited from Scotland and said there was nothing in the UK to better the weir at Sion Mills and its surrounds. It is certainly very spectacular and really awesome when the river is in flood. Our guides have specific access to some of the buildings that you normally couldn’t access on a self guided tour and with their specific insight into the Village you will gain a fascinating glimpse of village and mill life over the last 150 years. We can tailor your tour to suit the interests of your group. No matter what the interest we have a story they will want to see and hear. You may well have passed through and remarked on how unique the village is – now is your chance to stop, sit in comfort in our new Restaurant & Tearooms or venture out and explore one of the most historic villages in Ireland. 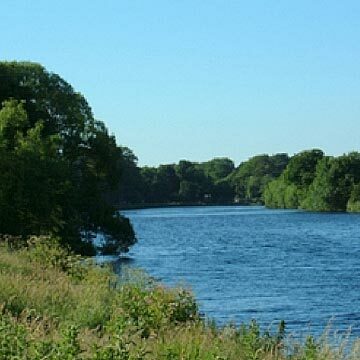 Sion Mills plentiful water resource which once sustained the village’s flax industry now provides an idyllic riverside haven and excellent angling facilities. The Mourneside Walk, an excellent riverside amenity, features the popular ‘Bearney’ Footbridge known locally as the ‘Swinging Bridge’ as well as The Weir – an attractive fall in the which Salmon cross on the way upstream to the Strule, Derg, Owenkillew and Glenelly Rivers. N.B. Access restricted in many cases. Please seek permission from appropriate authority. Including the Mill complex as one, there are 41 listed buildings in Sion Mills. Collectively the simple, single and two storey gothic cottages built to house the mill workers contribute greatly to the architectural and historical significance of the village. Their presence alongside that of the old flax spinning mill, founded in 1835, give a wonderful sense of the industrial heritage which once dominated the national landscape. The Mill is a large complex of buildings sited on the River Mourne, (architecturally the most important of which is the main 5-storey stone building with yellow brick extensions designed by William Lynn in 1853), with an impressive chimney and huge water-power system which, until after the First World War, produced the highest water horse power in the British Isles. One of several structures in Sion Mills identified as being of special architectural interest. Dedicated on 15th May 1909, the Church of the Good Shepherd was designed by Mr W.F. Unsworth (who also designed the first Shakespeare Memorial Theatre, Stratford-on-Avon) – a son-in-law of Mr James Herdman. He chose a church near Pistoia, near Florence as a model and the design is in elaborate Italian renaissance. 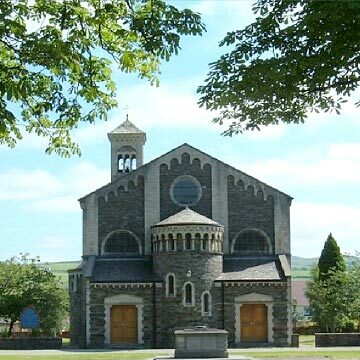 This particular style of architecture, for a church, is unique in Ireland and it is believed there is only one other church in this style in Great Britain. By contrast the Roman Catholic Church in Sion Mills is contemporary in nature. Designed by Patrick Haughey this structure is the subject of widespread attention and has secured an international architectural award. Although modern (1968) St Theresa’s Church is an example of a building constructed in sympathy with its surroundings and integrating into the landscape. 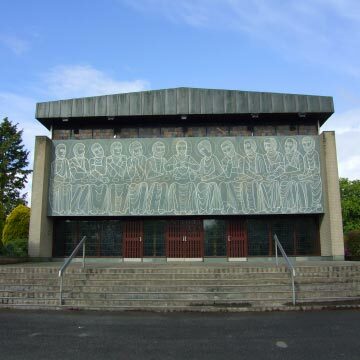 The front is dominated by a slate mural of the Last Supper by Oisin Kelly with designs and patterns reminiscent of The Romanesque Period. Again under the supervision of W.F. Unsworth, Sion House originally built in 1845, was remodelled in 1884 into a half-timbered mock Tudor building with a red tiled roof and intricately patterned chimneys. 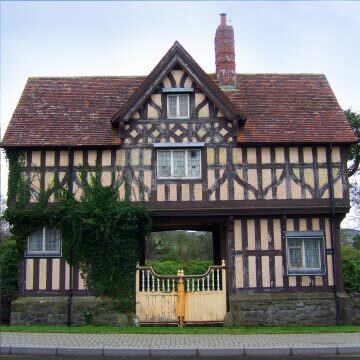 A Gate Lodge and Stables with Clock Tower were built at the same time and in similar style.